WASHINGTON (Reuters) - U.S. Senator John McCain, a former prisoner of war in Vietnam who ran for president in 2008 as a self-styled maverick Republican and became a prominent critic of President Donald Trump, died on Saturday, his office said. He was 81. Why am I not shocked that the moron that is T's Hero was the most stupid person to ever issue from the Naval Academy? Although it is likely that McCain was not the sole Admiral's son who had the minimum Intelligence Level waived for Commissioning, his complete lack of any alternate redeeming quality landed him in the absolute bottom of his Class. After he single-handed converted to scrap metal the most expensive military weapon in the history of mankind, the Navy whitewashed that incident and then became less willing to hand out IQ waivers to retards like candy. He was never allowed to serve on a Nuclear Powered Carrier. How fitting T proclaims him to be his Hero. Dunces need to stick together. ow-and-political-maverick-dead-at-81-statement-idUSKCN1LB00C am I not shocked that the moron that is T's Hero was the most stupid person to ever issue from the Naval Academy? First of all. The flags are flying at half staff so I don't really feel the need to defend my thread honoring him. Secondly, this is not real world so you really should try and act like a rational adult if you can manage it. The thread title already made clear that this was not the Real World. 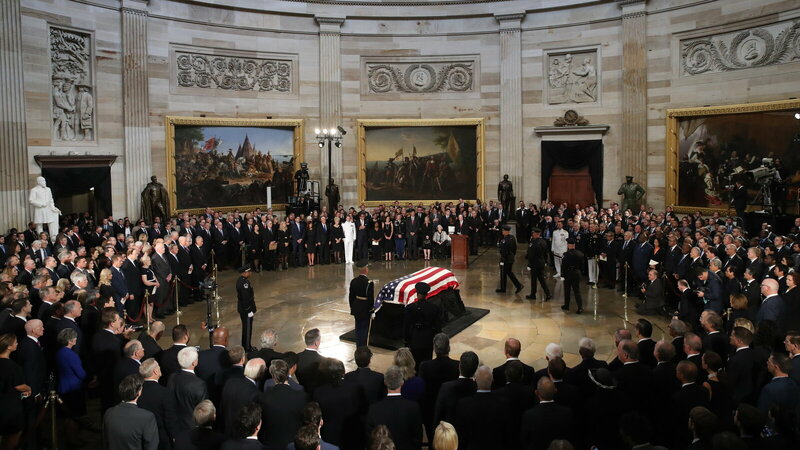 Leaders from both parties gathered in the U.S. Capitol Rotunda on Friday to honor McCain on the third of five days of memorial celebrations in Arizona and Washington for the Vietnam War hero and two-time Republican presidential candidate. He pissed me off sometimes, (Obamacare repeal vote) but he spent 5 1/2 years as a POW. They offered him an early out but he refused it, he would only leave with all the other POW's. I'll forget about the times he pissed me off, (Not that often) RIP Captain McCain. I have not heard word if Sarah Palin was invited to the festivities. Knowing enough about McRINO, I can guess the answer. I think the family is only inviting personal friends, McCain linked Palin but I don't believe the McCain's and the Palin's were very close. as for Trump not attending, that's the job of the VP to go to all the funerals. My uncle was a war hero, he got a Silver Star, the President didn't go to his funeral either. Former Presidents Obama and GW Bush are there to my understanding. Remember also this is a man that served his country. I don't want to turn this into a thread that only belongs in real world so I won't. McCain earned a good sending off. By all accounts he got one. It was widely known that if Media wanted an interview with the most Liberal RINO McCain, he required that you first recite his narrative of POW and refusing to accept release. Every single interview, or else he would not participate in the body of the interview. It is good that you were able to absorb the faux-humility that he trained you to remember. I didn't see the funeral Saturday, I was out all day. I read that Megan McCain, Bush and Obama took shots Trump at the funeral, proof that the swamp people have no class. If he was King of The Swamp, I wonder how many folk realize that one huge drainclog was just removed. himself, and he did serve his country with distinction. He did love his country. I did not always agree with his politics, but you have to give him his due. Some people just can't deal with that. From what I understand, he got a presidential send off. One of 33 people in U.S. history to receive such an honor, to lie in state in the U.S. Capitol Rotunda. The honor is authorized by congressional resolution or approved by congressional leadership. So please ignore any comments from the peanut gallery, and I will say nothing further about that. You're right T, this is NOT RWED.